Protecting the Ozone Layer & Bystanders by Destroying Fumigant Emissions. Our proprietary scrubbing system chemically destroys methyl bromide vented from Quarantine & Pre-shipment (Q/PS) fumigation enclosures of up to 300,000 cubic feet (8,500 cubic meters) without delaying the aeration cycle or velocity of fumigated products as they pass from the fumigation chamber into the distribution chain. Two independent Source Tests have validated the removal of 92% to 94% of the methyl bromide used in Q/PS fumigations. We are the ONLY company to offer validated methyl bromide emissions controls on this scale and ours is the ONLY performance based methyl bromide emissions control system on the market. This technology is listed in the California Best Available Technology Clearinghouse database under source category 'fumigation'. For very large volume fumigations Value Recovery, Inc has developed a two-stage system to destroy methyl bromide present in ventilation air stream. Air is ventilated from the enclosure using large fans that pull fresh air under suction into the enclosure and "sweep" the air containing methyl bromide into the outlet stream. This methyl bromide laden air stream is then passed over a large carbon bed where the methyl bromide is adsorbed or trapped on the surface or and within the carbon particles. The ventilation rates from the fumigation chambers meet and exceed APHIS standards (minimum of 4 air turnovers per hour) and thus do not influence the time it takes to aerate the fumigated goods. The length of time for the ventilation is fixed by USDA protocols to ensure that all of the methyl bromide is desorbed from the fumigated goods. In this process, the carbon is NOT replaced from cycle to cycle and is used over and over again, thus the customer purchases the carbon once and does not have to purchase any more. Our longest running operaton has used the same carbon for four years without replacement thus providing a major savings in operations cost. 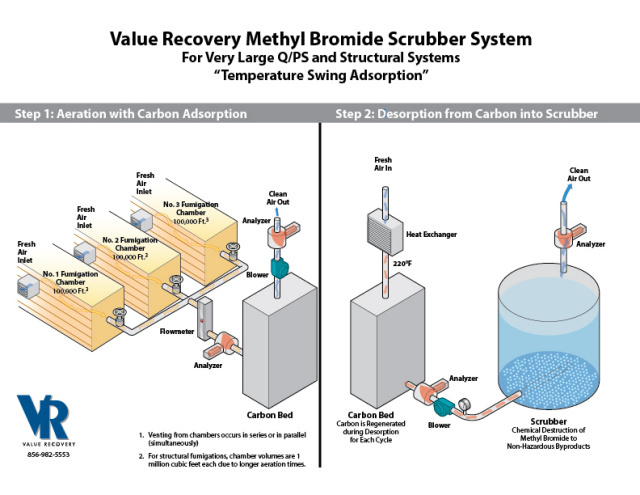 After the aeration step, the methyl bromide is driven off the carbon using a relatively small volume of fresh warm air and then introduced into the scrubber where the methyl bromide is chemically destroyed. The air is warm enough to re-generate the carbon for the next aeration cycle and thus the carbon bed is used over and over again making this a very economical process. The design allows for the carbon bed to be re-generated and used every 24 hours and thus the carbon is NOT replaced from run to run, saving significant operating costs. Temperature swing adsorption has been known in the chemical industry for over 70 years and this is a straightforward implementation of these principals. The methyl bromide (MB) is destroyed chemically by breaking the air stream containing MB down into fine bubbles to allow the MB to easily contact the liquid scrubber solution. 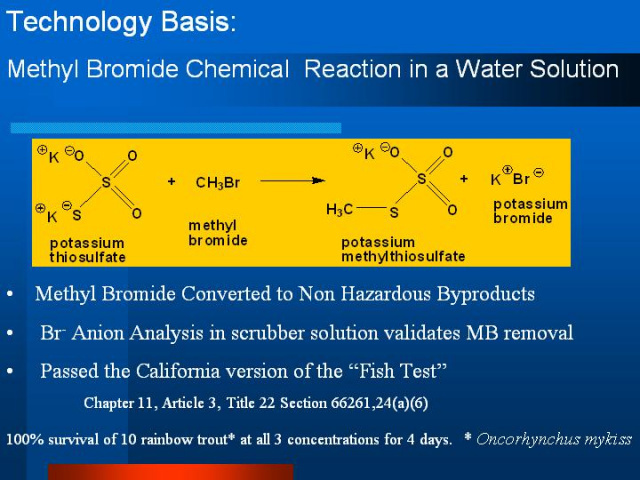 The liquid solution contains potassium thiosulfate (sodium and ammonium analogs of thiosulfate also work) and the MB reacts (and is thus destroyed) quickly with it to make potassium methyl thiosulfate and potassium bromide as shown below. The scrubber solution is a clear aqueous solution with no particulate. The carbon-halogen (carbon-bromine) bond within methyl bromide is broken in a fast nucleophillic substitution reaction that produces no hazardous byproducts. Finely dispersed air bubbles provide enough contact area with the surrounding liquid to allow for significant gas-liquid mass transfer of the methyl bromide to the aqueous phase where the reaction takes place. The spent scrubber solution has passed the California "fish test" [(Chapter 11, Article 3, Title 22 Section 66261,24(a)(6)]. This test showed a 100% survival of rainbow trout over all three concentrations tested over 4 days. After the scrubber solution has been exhausted it is replaced with fresh thiosulphate solution. The spent scrubber solution is then disposed of as a non-hazardous aqueous waste at a cost of less than $0.15/gallon. In essence, our technology takes advantage of methyl bromide's exceptional reactivity, and uses this reactivity as the strategy for destroying methyl bromide after fumigation by irreversibly converting it into a benign and thus safe chemical species. Note: Value Recovery does not use the the colloquialism known as 'recapture'. Unfortunately, this rudimentary term has gained wide acceptance due to the advocacy of a non-scientific standard. The standards we advocate are based on the chemical industry and thus "emissions controls" is the proper representation for this process since the process of emission control is commercially practiced as a pollution control strategy in oil refineries, chemical plants, catalytic converters on automobiles and drycleaners. For instance, if a child caught a butterfly, let it go and then caught it again this would demonstrate 'recapture'. How this applies to methyl bromide pollution prevention is baffling.